Holy Family Junior School is a junior primary school in Ennis, Co. Clare. It has 180 students, 18 teachers and seven Special Needs Assistants. They were awarded their Green Flag for Biodiversity in May 2017. The Green-Schools Committee consists of one student from every classroom. 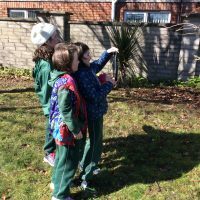 That means that the Committee is made up of three students from junior infants, three from senior infants and three students from first class. The school also has a Deaf Unit and a Speech and Language Unit and these classes are also represented on the Committee. There are also three teachers, the school principal and the caretaker on the Committee, bringing the membership number to 16. They have a formal Committee meeting once a term but the Green-Schools Coordinator also meets with the other members on a more regular basis. Revisited previous themes (i.e. Litter & Waste, Energy, Water and Travel) to identify links between them and the Biodiversity theme. Bulbs that had been growing over the summer had been planted in areas where there is a lot of student traffic and got trampled. 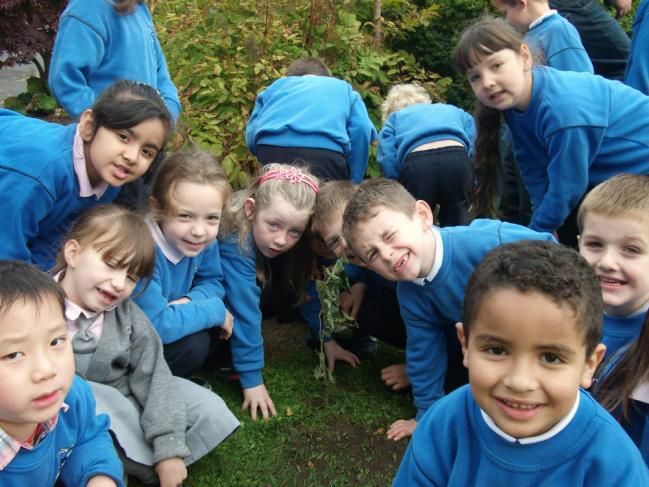 No one knew the species of trees that were found in the school grounds. They did not have a wildflower area. While they had a large garden area with numerous different plant species, they identified that they were not using the area to its full potential for promoting and supporting a really high level of biodiversity. Investigating the importance of Biodiversity. Investigating major threats to biodiversity locally/nationally/internationally. Investigating practical ways in which they could help conserve it. Investigating the local area and identifying any protected sites such as SACS/SPAS/NHAS or National Parks and find out why they are protected. Informed the parents that the school would be working on the Biodiversity theme. Updated the Green-Schools notice board to reflect the new theme and so that the previous four themes were revisited. Identified areas of high biodiversity already in the school grounds. Developed an understanding of the terminology of biodiversity among all students. Planed spring bulbs such as daffodils and tulips, as well as snowdrops, hyacinths and buddleia. Installed signs where new planting had occurred to reduce trampling. Installed and maintained bird feeders around the bird table. Installed bird boxes to promote bird nesting on the school grounds. Native tree planting and identification. Designated an area of the garden for mini-beasts, creating a bug hotel and investigating different habitats of mini-beasts. Designed a leaf pile house. Created a wild flower garden to promote pollinators. Linked in poetry with the theme of biodiversity. Created a Nature Trail around the school grounds. Investigated different threats to biodiversity. Linked the food that they were eating with biodiversity. Linked all previous themes to biodiversity. A first year teacher, Ms. Diane Hennessy, went on to give an excellent presentation on how the Green-Schools programme is implemented in her school to teachers from various European countries at the local Education Centre in Ennis. Including a short repeat survey at the end of Year 1 to examine the level of awareness in the first year students before they moved to the senior school. 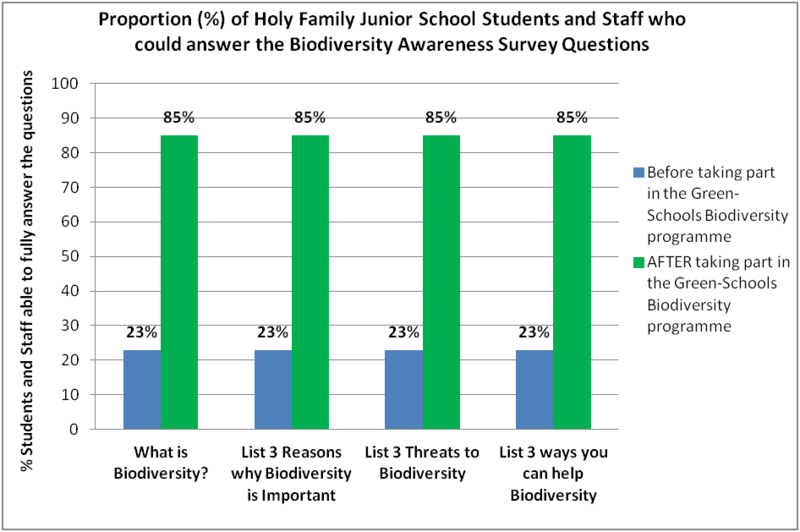 This survey found that the first year students had increased their awareness of biodiversity form 23% to 94% by the end of Year 1. The Committee created a timeline of all actions taken over the time and this is displayed at the reception area. 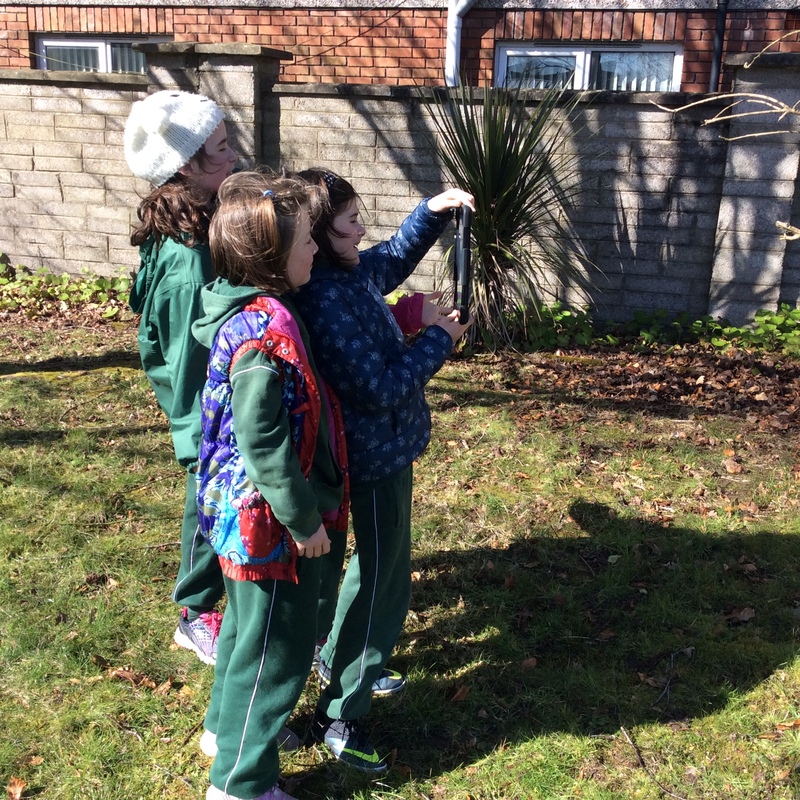 All students take regular walks around the school grounds recording bird species and discuss the plants, mini-beasts and other aspects of the garden. Figure 1: Students’ Biodiversity Awareness Results – from before (during the Environmental Review) and after actions were taken to improve awareness and biodiversity levels in the school. 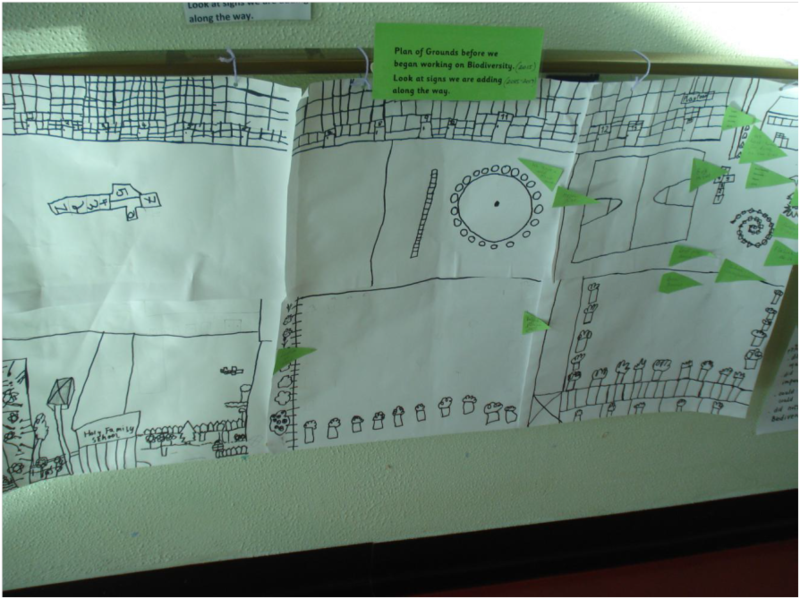 Image 2: Holy Family Junior School Habitat Map 2 (after action was taken) – essential for The Monitoring and Evaluation step. Ensure waste is put into the correct bin. Students follow the tidy classroom checklist with the tidiest classroom award once a week. Students are encouraged to use reusable lunchboxes and water bottles. Recycling materials for biodiversity such as painting and planting in old tyres. An appointed Energy Sheriff ensures all the lights are turned off when the classroom is not in use. The code for the Energy Theme is still displayed for all to see. Rainwater collected in old plastic containers and a 5 gallon drum for watering plants. Ensure all taps are turned off fully. Students are encouraged to take part in Walk on Wednesday. The golden boot award is used for the best class. Participation in other initiatives such as scoot to school. The code for the Travel Theme is still displayed for all to see. SESE Species studied: Fox, spider, penguin, polar bear, honey bee, butterfly, wild flowers, mini-beasts. Nature walk / How plants drink? / Planting bulbs / Comparing animals from hot and cold countries / Observational skills while watching wildlife and planting trees over four seasons / Animal homes and habitats. Literacy and Communication Vocabulary related to biodiversity, recycling, nature, energy and water. Oral and written reports on endangered species. Reading about biodiversity, nature and wildlife and discussing these themes. SPHE My School Community – development of responsibility for our garden through working on it. 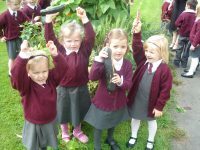 The school set up a Biodiversity Action Time, where all of the students get a chance to be actively involved in the school garden. This time takes place on Fridays at 11:15 AM. During this time the students observe the nature around them and pick up any litter. The school took a biodiversity walk around the school each week in year two and the Green-Schools Coordinator sends regular emails to inform other teachers and students of what work is happening on the theme. The school had a visit from Leif Barry who delivered talks on biodiversity to the different classes. Notices on classroom doors and windows. 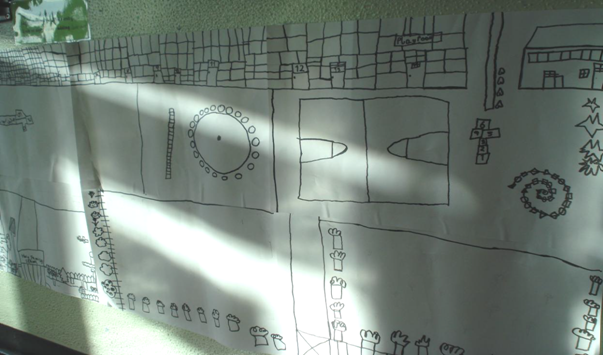 Photographs of Activities around the school. Classroom visits by children to advertise an event or show and tell an item linked to biodiversity. Linking with the Parish Office for community involvement. News article on bug hotel in the Clare Champion paper. 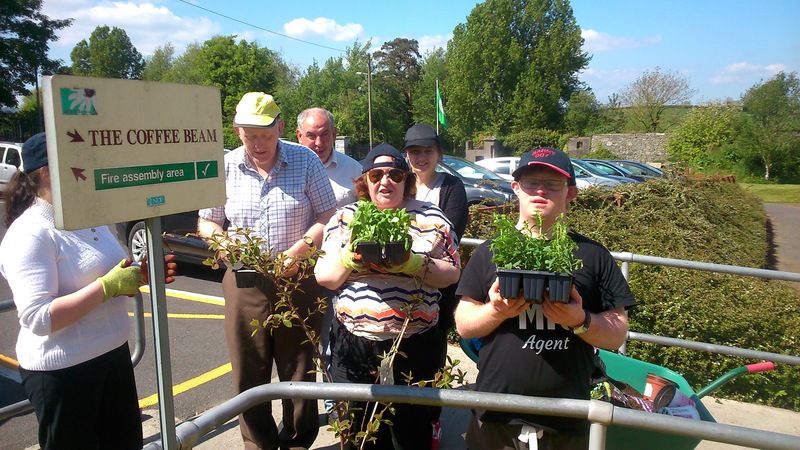 Invitation from the Clare Garden Festival for the school to take part in their biodiversity competition. The green code was written by students from Room 4 and Room 5. It is displayed at reception and in the school corridor. Awareness is happening very naturally and holistically – it’s not a specific time on the timetable but rather a constant. 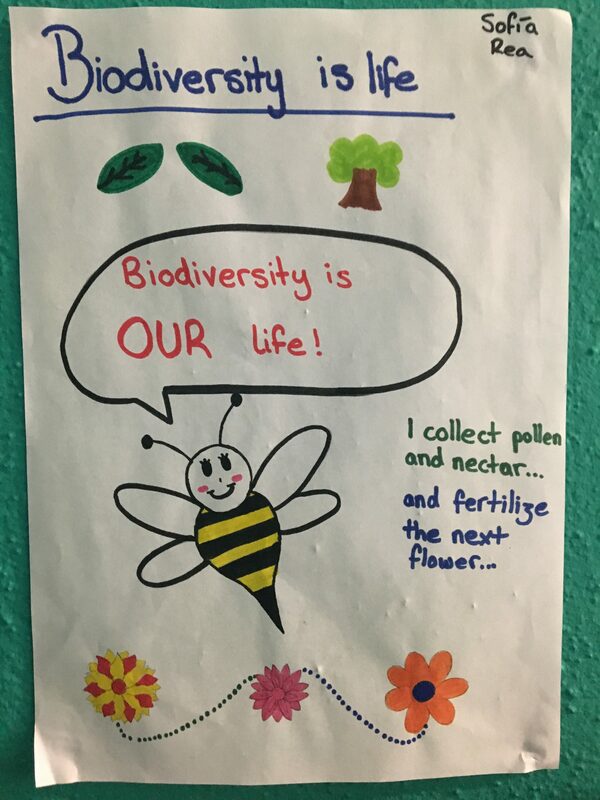 Overall our school love working on Biodiversity. The children loved it and really enjoyed the hands on approach and certainly learned a lot. The adults involved worked with great enthusiasm. Thanks to everybody for their input in making this so successful. It is lovely to see the ongoing projects develop. Well done to all.